THE new runway configuration implemented at the Caticlan Airport in Aklan is already reaping some opposition from resort owners on Boracay Island. The Department of Tourism (DOT) has promised to look into concerns of tourists to the resort island famous the world over for its long white beach. 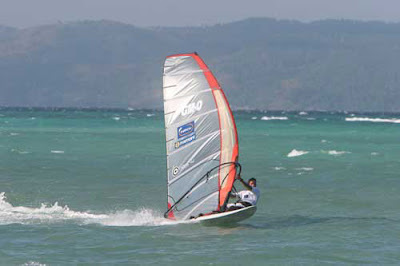 As president of the Boracay Windsport Association, Graf said the Civil Aviation Authority of the Philippines (CAAP) rule particularly impacts on those guests coming from Hong Kong on the weekend to windsurf and kitesurf during the current habagat (southwest monsoon) season. “Before, they can still enjoy three hours of kiting before sunset on their first day, or windsurfing if they leave Hong Kong in the morning. Now it is not possible with three to four hours travel time from Manila to Boracay, or more if domestic flights are delayed. Like [yesterday], the guests arrived in Manila at 11:30 a.m. and [were] supposed to fly at 1:30 p.m. to Caticlan with Cebu Pacific, only to be told that their flight is diverted to Kalibo, and the flight will be delayed by an hour-and-a-half. They arrived at 6:30 p.m. in the resort. They traveled for one day and they will go back on Monday via Kalibo again. They complained, and were given a free ticket valid for one year, but I doubt if they will come for the weekend again,” she explained. Usually, if traveling to Manila via Caticlan, say on a 12 p.m. flight, passengers only have to check out of their resorts and leave Boracay by 10:45 a.m. to make the flight. If traveling via Kalibo, however, guests have to make sure they leave Boracay by 8 a.m. Guests have also started complaining of the confusion in the major carriers’ check-in procedures owing to their pullout from Caticlan. Meanwhile, Tourism Secretary Joseph “Ace” Durano expressed concern over the new CAAP ruling on Caticlan’s runway configuration. He promised to look into ways for the Boracay guests to keep flying into Caticlan without compromising their safety. The CAAP’s ruling effectively shortened the takeoff and landing distance for planes in Caticlan, forcing major carriers like Philippine Airlines and Cebu Pacific to cancel their routes there. They now fly Boracay guests via Kalibo and are currently footing the costs of transferring passengers to Caticlan. Only Southeast Asian Airlines continues to fly to Caticlan. He declined to disclose what these alternatives are pending their finalization. Department of Tourism Western Visayas Director Edwin Trompeta earlier expressed confidence that Boracay would still see continued strong tourist arrivals despite the pullout of major carriers from Caticlan. In the first half of the year, tourist arrivals in Boracay grew by 6 percent to 383,313 from the 362,228 registered in the same period in 2008. Since Zest Air’s second accident on June 25 involving its China-made MA60 plane—the first accident being in January 2009—the CAAP had decided to reassess the runway configuration and landing/takeoff procedures at the Caticlan Airport. Most analysts noted that due to the larger size of their planes, PAL, Cebu Pacific and Zest Air are unable to fly into Caticlan with the shorter runway, especially during the southwest monsoon, when an aircraft is buffeted by strong winds. Most airlines agree that the permanent solution to the Caticlan Airport is to extend the runway. In 2007 officials of CEB, then Asian Spirit, and PAL had already discussed funding the runway extension, but nothing came out of it. On June 22 the Department of Transportation and Communications signed a build-operate-and-transfer (BOT) agreement with a consortium led by McDonald’s Philippines franchise holder George Yang which would upgrade the Caticlan Airport to international standards. The improvement of the airport, projected to cost some P2.5 billion, will be shouldered entirely by the Caticlan International Airport Development Corp. Under the terms of the BOT, the company has up to seven years to build and expand the airport, and 25 years to operate the facilities, before it is eventually turned over to the government. The upgrade includes the extension of the runways, which would allow larger planes to use the airport. 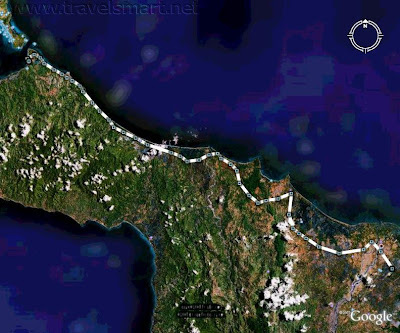 Attached to the project is a commercial component allowing Akean Resorts Corp., owned by investors led by Francisco Alba, former ambassador to the Vatican, to develop the 16-hectare area beside the Caticlan terminal into a hub for hotels, resorts and shops. “Akean” is the old name of Aklan. The government allows investors in pioneering tourism projects to avail themselves of duty-free importation of capital equipment and income-tax holidays up to five years. The upgrade of the Caticlan airport has been dubbed as the first-ever privatization of an airport in the country.